Basics-And now another thrilling tale of the ROCKET PATROL! 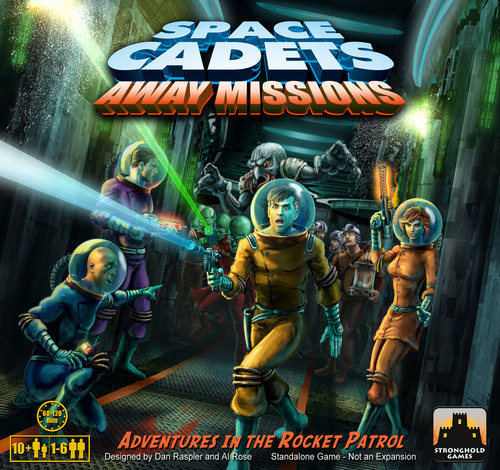 Enter the worlds of 60’s Golden Age Sci-Fi with Space Cadets: Away Missions. In this game, the players take the role of different members of the Rocket Patrol as they undergo some of their most famous missions. 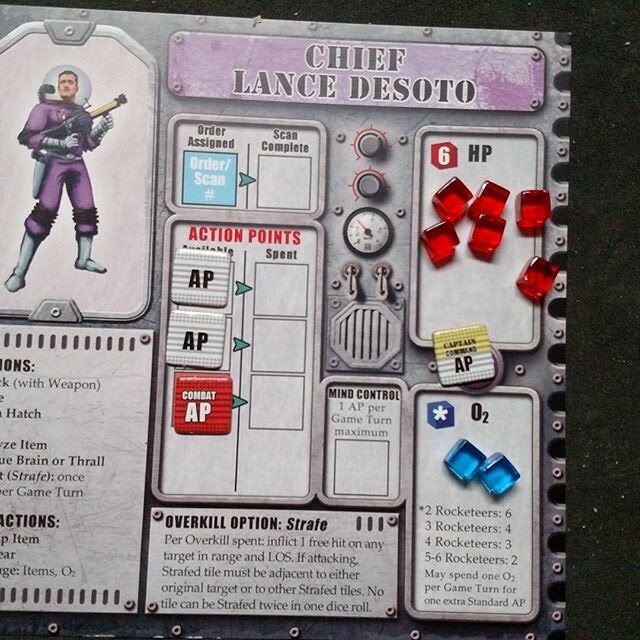 At the start of each game, a scenario guide instructs the players how to set up the game, what parts to use, what aliens will be necessary for this adventure, and an intro paragraph to set the mood of the game. After set-up, turns are pretty simple. First, players decide the player order, and then they take the tokens to signify that order. Next, players perform actions based on their available actions on their player board. Once all players have acted, the monsters all act in order of intelligence typically attacking the closest player and then attacking close players in reverse turn order. Each player has a different member of the Rocket Patrol who has a number of health and oxygen, action tokens, a IQ score, and a special ability. If ANY Patrol person runs out of health or oxygen, that player dies and all players lose the game. A player’s action are: move, attack, subdue thrall/brain-in-a-jar, heal, open/close/lock hatch, and some scenario specific actions. When you attack, subdue, heal, or do scenario specific actions, a player rolls a number of dice equal to the weapon strength at that range of the enemy (attack) or IQ (subdue, heal, som scenario actions) and counts the 1s, 2s, and 3s. Monsters attack in the exact same way. The key mechanic of the dice is overkill. For any action to succeed, you only need one success. However, if you roll more successes, you can spend these overkill successes to activate extra abilities such as one patrol person being able to take a free move action and another can attack another adjacent enemy. The enemies even have some overkill options that can be activated based on who the player hit. But, when the enemies score overkill, the also have options they can take to hamper the heroes. Play continues in these rounds until the heroes achieve the scenario goal or one player dies!